You will experience incredible moments of stillness, remoteness and revel in its vast open spaces. One of the most sparsely populated places in the world; it may therefore surprise you to fly into an unexpectedly modern, well-groomed city amongst such natural and barren terrain. Spend the beginning of your African adventure in Windhoek, perusing the colourful African curios and absorbing the busy city life. Not too large in size, Windhoek is highly walkable with its mixed population, a pedestrian-friendly city centre and its relaxed hassle-free vibe. Amble freely around the neo-baroque cathedral spires, spotting the rather misplaced German castles perching in perfect harmony against the tall high -rise buildings. After spending some time here you will then head south to Fish River Canyon. Situated along the lower reaches of the Fish River in southern Namibia, this is one of Africa’s most remarkable natural wonders - one simply not to be missed whilst in this part of the world. At 550m deep, 27km wide and 160km long, it is in fact Africa’s longest canyon, the second largest in the world. Of course, desert heat can soar to unprecedented temperatures, meaning the intense 85 kilometers hiking trail along the canyon floor is only accessible from May to mid- September. To accompany you on your hike here, we will arrange for you to meet a prolific geologist who will guide you along the canyon path, imparting rare and beautiful insights into the geological history that surrounds you. Following your epic adventure through the Fish River Canyon trails, we then suggest heading up to the Sossusvlei Dunes. This vast transient pan is set amid fiery red sand dunes that loom up to 200m above the depths of the valley floor. Such towering spectacles are perched majestically above 300m over the underlying strata. You will rarely see any water here, but occasionally the Tsauchab River gathers enough volume and momentum to push beyond the arid plains, completely transforming the area. The normally fractured dry land gives way to an exquisite blue-green lake, surrounded by verdant vegetation. In turn this provides a home to small aquatic creatures, birdlife and the sand-loving gemsbok and ostriches. 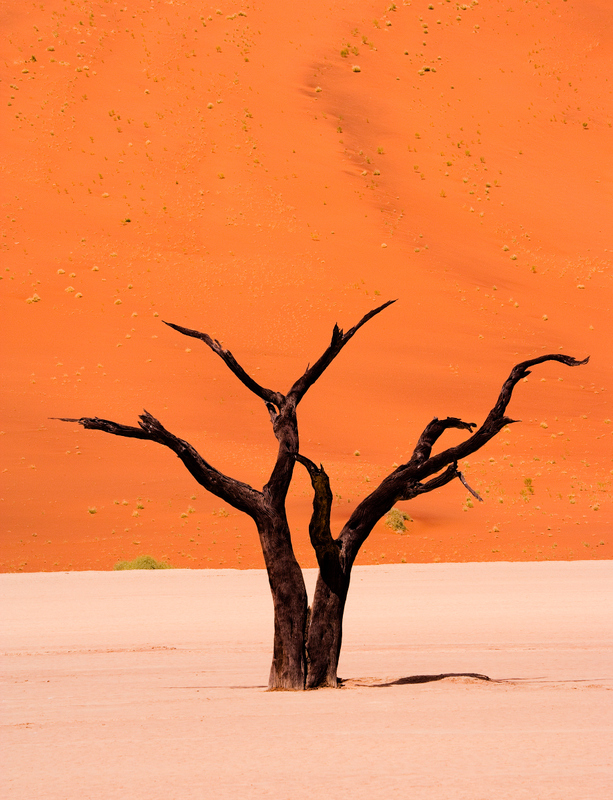 It is believed this sand originated in the Kalahari between three and five million years ago. Washed down the Orange River and swept out to sea, it then proceeded northwards with the Benguela Current depositing large swathes of sand along the coast. The only way to gain a real sense of the vast and heady heights of this sandy sprawl is to audaciously climb a dune. Whilst you are descending, why not don a sandboard so that you may glide down, an exhilarating way to take in the spectacular vistas before you. Having experienced the awe inspiring sight of the dunes, you will then head on to Swatkopmund. Here you will explore the haunting Skeleton Coast littered with ship wrecks, perhaps heading north to Cape Cross. Cape Cross is known to house the best breeding colony of Cape fur seals along the Namib coast, truly magical to see along your epic journey through Africa (although a tad pungent at times). Picture the wondrous sight of more than 100,000 seals frolicking in the surf before lolling wearily on the shore. Although famed for its fur seals, Cape Cross has a long illustrious history to its name. Take in the sights with your personal guide, using his in-depth historic knowledge and insights to follow in the footsteps of explorer Diego Cao, the first European to ever step foot in Namibia. Having explored Cape Cross, we suggest heading inland via the Damaraland where we will arrange a private meeting with the very rare Himba tribe’s people. The Himba are indigenous people of about 20,000 - 50,000 living in the Kunene region of northern Namibia. Here you will reside in a luxury camp beneath the endless starry skies residing in perfect harmony amongst these nomadic people. Whilst here, you will be led by your very own knowledgeable Himba guide, visiting different seasonal Himba settlements in rotation, so as to avoid disturbing or ruining the Himba’s way of life and their fragile culture. During the evenings, enjoy a spot of stargazing with an acclaimed astronomer highlighting the incredible sights to behold. Finally we suggest finishing this epic adventure in Etosha National Park, where you will encounter more traditional game. Discover the Etosha salt pan, so large it can be seen from space. Immerse yourself in the natural habitat of some of the rarest wildlife species on earth in the presence of your highly experienced guide. It is here you will encounter some of the largest elephants in Africa amongst the likes of the endangered black rhino and even the leopard. Before returning to Windhoek for your flights home, perhaps extend your journey and relax in Cape Town, you could do a spot of shopping with some of Cape Town’s up-and-coming designers, or head out to a nearby township to listen and chat with local jazz musicians over a braai (barbecue feast).